The Office of Safety is committed to providing a safe environment for older road users, including drivers and pedestrians. 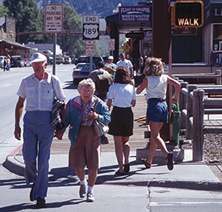 Practitioners need to consider differences in vision, fitness and flexibility, and reaction time when designing for older drivers and pedestrians. The Office of Safety's Older Road User program addresses the engineering aspects of highway safety. As the number of licensed drivers increase in age, it is important for a state or locality to consider the traffic safety facts associated with Older Drivers and Pedestrians. The NHTSA Traffic Safety Facts document offers general older population crash information. The desk reference is a concise guide that provides important information on Part I of the larger Handbook for Designing Roadways for the Aging Population. The treatments are categorized by roadway feature: intersections, interchanges, roadway segments, highway construction/work zones, and highway-rail grade crossings. The original Older Driver Highway Design Handbook was published by FHWA in 1998 (FHWA-RD-97-135). The 2nd edition, titled Highway Design Handbook for Older Drivers and Pedestrians (FHWA-RD-01-103) was published in 2001. This 3rd edition, under a new title, incorporates new research findings and treatments to improve the safety of the transportation system for the aging population. The Handbook is divided into three sections. The first section explains how to use the Handbook to select treatments to address problems for aging drivers and pedestrians. The second section includes treatments for 51 proven and promising traffic control and design elements distributed among five categories: Intersections, Interchanges, Roadway Segments, Construction/Work Zones, and Highway-Rail Grade Crossings. The final section of the Handbook includes the rationale and supporting evidence for the treatments. Published in 2004 as part of NCHRP Report 500: Guidance for Implementation of the AASHTO Strategic Highway Safety Plan, this guide outlines a variety of strategies that can assist State and local transportation agencies with addressing older drivers' special needs while improving safety for all road users. This Pocket Guide assists transportation professionals in making decisions about the use of traffic control devices, taking into account the unique needs of the Nation's older road users. The FHWA offers a 1-day training workshop to thoroughly review the recommendations and guidelines contained in the Handbook for Designing Roadways for the Aging Population. Interactive methods are used to help participants fully understand the changes that occur with aging. Modifications to the roadway system are identified that can make it easier for older drivers and all drivers. Case studies are used during the workshop. The workshop is designed primarily practicing highway and traffic engineers responsible for highway design and operations. For additional information, contact Gene Amparano, or contact the Federal Highway Division Office in your State. The Manual on Uniform Traffic Control Devices, or MUTCD, defines the standards used by road managers nationwide to install and maintain traffic control devices on all streets and highways. The Manual is important as it provides national traffic control standards for all public roads, and includes traffic signals, signs, roadway stencils, pedestrian crossings, and bicycle and pedestrian treatments. The Highway Design Handbook for Older Drivers and Pedestrians, being updated this year, is provided leading research information which may, as verified and tested, become standards in the MUTCD in future years. The electronic version of the MUTCD 2009 is the most current edition on the MUTCD Web site and is the official FHWA publication. This guide showcases national and international noteworthy practices presented during each conference track: infrastructure and vehicles; driver screening and assessment; driver education and training; alternative transportation, mobility management, and coordination; and housing and land use. The agencies and organizations featured in this guide have significantly improved the safety and mobility of our older population through the use of various techniques and programs that can be replicated nationwide. Highlights of GAO-07-413, a report to the Special Committee on Aging, U.S. Senate, reports on (1) what the federal government has done to promote practices to make roads safer for older drivers and the extent to which states have implemented those practices, (2) the extent to which states assess the fitness of older drivers and what support the federal government has provided, and (3) what initiatives selected states have implemented to improve the safety of older drivers. The National Highway Traffic Safety Administration (NHTSA)'s Older Driver program focuses on public education and traffic law enforcement issues. Their Web site includes a series of handbooks for older drivers with specific medical conditions and other useful public information. Scope: Stimulate quality research and evaluation, provide a forum for interested researchers and practitioners to disseminate research and related information to those involved and interested in improving the safety and mobility of older drivers. The FHWA's highway safety research is conducted by the Turner Fairbank Highway Research Center, which is the research arm of the FHWA. The Office of Safety works closely with the Office of Safety Research at Turner-Fairbank to develop and conduct research, and to implement research recommendations through the development of practical tools and guidance for practitioners and decision makers. The Mission of the AAA Foundation for Traffic Safety is to identify traffic safety problems, foster research that seeks solutions, and disseminate information and educational materials. The Foundation’s current research projects links to an updated description of the named project, including achieved milestones. Recently completed research projects are listed under the “Completed Projects” header below. The National Center on Senior Transportation is funded through a cooperative agreement with the U.S. Department of Transportation, Federal Transit Administration and with guidance from the U.S. Administration on Aging. NCST is administered by Easter Seals Inc. in partnership with the National Association of Area Agencies on Aging (n4a). The AARP Public Policy Institute has done a considerable amount of research into older driver transportation needs, habits, physical limitations, and dependency on automobiles. Public Roads is the bimonthly magazine of the Federal Highway Administration (FHWA). Reading Public Roads is the easiest way to keep up-to-date on developments in federal highway policies, programs, and research and technology. A number of articles have been reported over the years on Older Drivers.